Actually I'm very fond of having chicken livers but no-one in my family likes them as much as I do.After sending my son to school I tend to get bored so I will tuck my daughter in her pram and visit the shops near my apartment. There's a World Market just a distance away and they have all the fresh vegetables and very wide range of cheese and breads. As I was luxuriantly strolling there -I spotted some very fresh chicken liver at the counter. I guess if no-one eats..I can still pamper myself with the whole plate rite why not??? Clean the liver, remove all the skin and cut roughly and add 1/4tsp turmeric powder and a pinch salt-mix well and keep aside. Heat 2tsp oil in a kadai splutter curry leaves,cumin,mustard,cinnamon,cardamon and clove till fragrant. Then add the chopped onion and saute till they turn browned followed by the chopped tomatoes..As the oil separated from the mixture add the chicken liver. Saute for about 10 minutes. Meanwhile grind all the ingredient for the paste and then add to the chicken liver- close with lid and let them cook until the gravy thickens. Remove the lid and adjust the level of salt and spice. Remove from flame and serve hot with steam rice. ooh thats a gorgeous liver fry.. I loveee this liver fry, but mine is completely different from urs...yummyilicious! 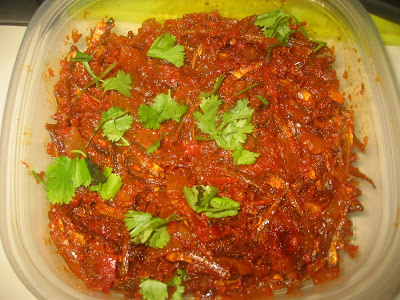 This is ma grandma's fav dish..Looks spicy and yum.